New details from Weekly Famitsu. 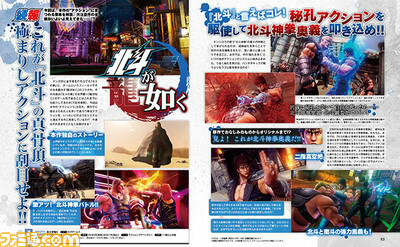 The latest issue of Weekly Famitsu has new information on Hokuto ga Gotoku‘s “Pressure Point Action” system. “Just Pressure Point” is a technique that takes advantage of pressure points to deal great damage by pressing the Circle button with good timing. The remarks uttered by dying enemies can be possessed as weapons or become items. “Abeshi Collection” is an element that lets you collect the remarks uttered by dying enemies. 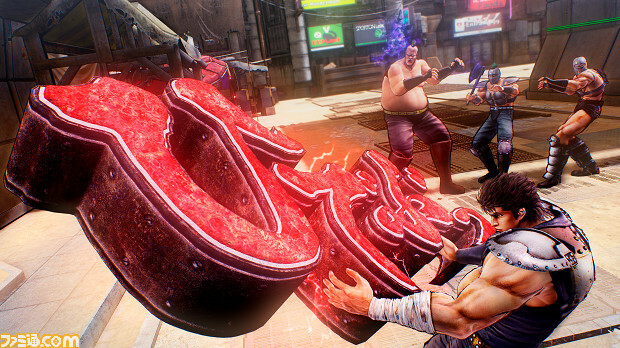 “Burst” is a technique that significantly strengthens Kenshiro and can be triggered by building up the gauge charged each time you defeat an enemy. “Destiny Gems” can be inserted into the status board to activate corresponding abilities. “Zodiac Talismans” can be equipped to strengthen Kenshiro’s abilities and learn new techniques. When activated, cut-ins drawn by the illustrator of the manga will appear on the screen. By acquiring Raoh’s talisman, Kenshiro can use his “Tensho Honretsu” technique.